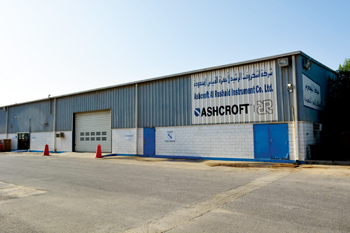 Aarico, the Saudi-based Ashcroft Al Rushaid Instrument Company Ltd and maker of sophisticated pressure and temperature instruments, has expanded its international portfolio of customers adding two key parties in Bahrain and Kuwait. Aluminium Bahrain (Alba), the Gulf’s oldest aluminium smelter, and Kuwait Joint Operations (KJO) imported for the first time products manufactured at Aarico’s Jubail Industrial City plant, said Aarico general manager DR Pai. They joined Aarico’s overseas customers Kuwait National Petroleum Company, Kuwait Oil Company, Equate and Chevron (all in Kuwait) and Tatweer, Bapco and Banagas (all in Bahrain). The company’s main Saudi customers are Saudi Aramco, Sabic, Sipchem, Saudi Chevron, Marafiq, Saudi Consolidated Electricity Companies (Sceco) and Saline Water Conversion Corporation (SWCC). “With the strong support from Ashcroft’s Korean counterpart, Korea Nagano Company (KNC), Aarico was successful in winning some big projects in Saudi Arabia in 2014. The major wins include packages of the Petro Rabigh, Jazan and Shaybah projects. In 2014, Aarico’s total output was 23,300 instruments with pressure gauges being the prime product – contributing 85 per cent of the total volume. The company assembles Ashcroft pressure gauges, thermometers, thermowells and switches with pressure gauges usually the fastest selling. Aarico instruments have applications in water treatment facilities, biotech and pharmaceutical labs, semiconductor facilities, refineries, power generation plants, chemical and food processing factories and pulp and paper mills, among other facilities. “No new products were added to the manufacturing line in 2014. However in the two years prior to 2014, the newly introduced products including gauges with DIN standards delivered in a stainless steel case got stabilised in the production line,” said Pai, adding that local manufacturing of the new products made Aarico’s price very competitive in Saudi Arabia and Bahrain. The Aarico plant is certified for ISO 29001:2010 and ISO 9001:2008 and its products are certified according to SASO and UL standards. Ashcroft Inc products are considered a benchmark in pressure and temperature measurement and include gauges, thermometers, switches, transducers, transmitters, instrument isolators and diaphragm seals and control and calibration equipment. Pai has highlighted that the Aarico plant strictly conforms to Ashcroft manufacturing and quality assurance procedures, thereby ensuring that all products made at the Jubail facility have the same field performance as those in Ashcroft plants in the US and worldwide. Staff at Aarico are trained and certified to perform assembly work, testing and calibration conforming to national and international standards. 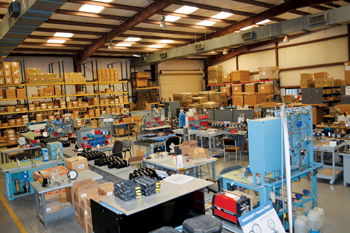 The plant is equipped with modern manufacturing and assembly and test stands and holds sufficient inventory parts for producing more than 30,000 pressure gauges as well as 3,000 temperature gauges and pressure switches per year. Thanks to continuous support from Ashcroft USA and Ashcroft Europe, the Aarico sales team is able to provide superior technical support and engineering solutions to their clients for major projects such as those in the oil and gas sector, Aarico says. 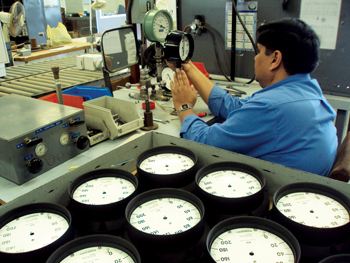 The company renders calibration services for pressure and temperature instruments of any brands as per ANSI standards. Aarico highlights as one of its achievements a stocking programme for fast-moving items with the integrated software AIMS and long-term agreements with major oil and petrochemical companies Saudi Aramco and Sabic. Leading EPC contractors that have conducted business with Aarico include Bechtel, Technip, Snamprogetti, Technicas Reunidas, Fluor, Foster Wheeler, Hyundai and SNC Lavalin. In the home market, Aarico products have been used in Saudi Aramco’s Khursaniyah gas plant, Rabigh development project, Khurais gas project, Hawiyah gas plant, Shaybah central processing facilities, Juymah gas plant expansions and the Aramco OC BV Khursaniyah production facility, among other schemes. Sabic projects using Aarico products include Sharq’s third expansion for ethylene and the Yansab high-density polyethylene project. Ashcroft pressure and temperature instruments have been manufactured in Saudi Arabia since 1983 and supplied through Darvico but in 2006, with the realignment of the Ashcroft business worldwide, the company became part of Nagano Keiki of Japan, renowned as one of the world’s largest manufacturers of pressure and temperature gauges, sensors and transmitters, among other things. Aarico is the only company which represents both Ashcroft and Nagano Keiki products in Saudi Arabia, but while the Saudi firm assembles Ashcroft products it only distributes Nagano Keiki products and Pai said there were no plans to graduate from distribution to manufacturing in the latter case. “The integration of both US and Japanese technology helped Aarico to stabilise a hot seat in the Middle East market,” Pai said in past comments.